Tethered goats and sheep stand in a kraal at Yakwach in the foreground, with a byre (luak) and huts beyond. The buildings have extended grass thatches covering the pole and mud walls to allow rainwater to drip away from the walls, which would otherwise weaken the structure. Note on print reverse ms pencil - "43 3 A49" & print front border ms ink - "NUER X/4"
Morton, Chris. 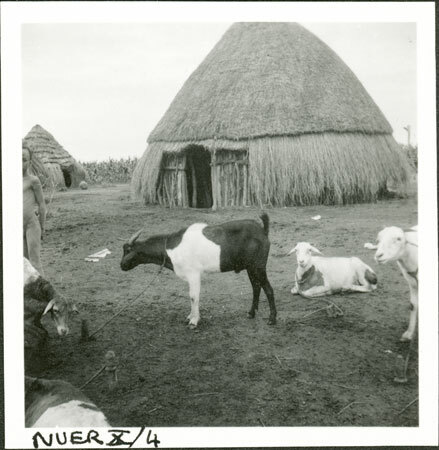 "Nuer goats in kraal" Southern Sudan Project (in development). 03 Jan. 2006. Pitt Rivers Museum. <http://southernsudan.prm.ox.ac.uk/details/1998.355.450.2/>.